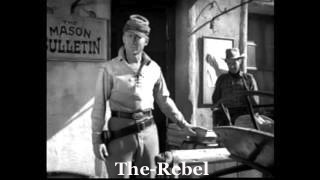 This Show is also called The Rebel and stars Nick Adams as a wanderer after the civil war. There are 76 episodes of this classic western tv series each 30 minutes long. The show originally aired on CBS October 4, 1959 – June 18, 1961. There are many wonderful guest stars on these western shows. The Rebel TV show Panic Seeing vultures circling a cabin Johnny Yuma rides to investigate and discovers a family stricken with illness. This episode is very tense and has a surprise ending! Nick Adams, Karl Swenson, J. Pat O’Malley, Jamie Farr, Allen Kramer. The videos will just say loading but will not play on my kindle fire can you help me .? My wife bought me a kindle fire and I had lots of problems with it. LOTS of Problems. We took it back and got an Ipad and it has been great . I am sorry I dont know why yours wont work with this site .